BW3 Grape Road is HOT for a New Look! BW3’s on Grape Road is getting a face lift….No that is not the name of one of their new sauces but rather a complete interior and exterior re-brand. ANCON Construction has taken on the challenge to completely demo the interior of the building and make major changes to the exterior, rebuild and re-open within a two and a half week window. Yes, that’s right in, in less than three weeks we will have completely remodeled the interior and exterior of a large national brand restaurant. It was a big challenge but we were able to coordinate with the local franchisee and by using multiple crews and multiple shifts progress is underway. The new concept brings more light to the interior, changes out the bar, opens up the space by removing walls, designer flooring and adds elements of rustic brick on the inside walls. All new beer dispensing system and lines have been ran as well. Virtually nothing was left untouched. We have been recording the project with our GoPro…look for time lapse video coming shortly. Still need to get your BW fix? No worries, while the Grape Road location is closed for the remainder of the project the Elkhart, South Bend (Southside) and Goshen locations are all still open. 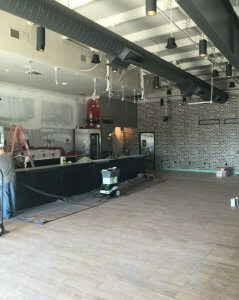 New Bar, Brick Accent Wall & Designer Flooring Installed Today! Re-Branding a restaurant in two week is a big job….our team, experience and client focused coordination are what give us the confidence we can do this project and exceed expectations.